Buying a low mileage used car can come with a lot of different advantages, giving you many of the benefits of buying new without the high retail costs. 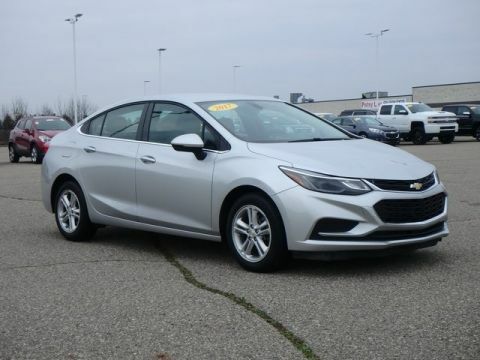 If you’re looking into getting a high-quality low-mileage used car for your Flint, MI commute, start here and explore the extra features you can afford on everything from a subcompact sedan to a five-passenger crossover. When you’ve found the car you’re looking for, read on to see why Patsy Lou Buick GMC should be at the top of your list for financing, maintenance, and more. 2014 Buick Verano Base CARFAX One-Owner. Leather, Back Up Camera, Alloy wheels, Front dual zone A/C. Odometer is 7139 miles below market average! PATSY LOU BUICK GMC/ MEGA LOT 810-732-7500. 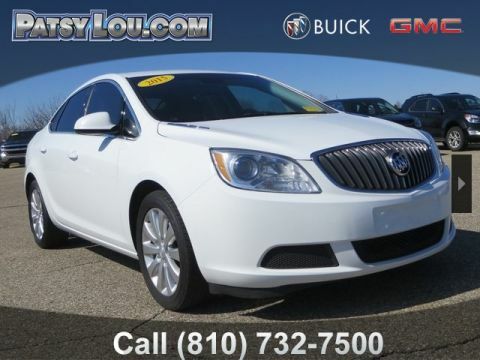 2015 Buick Verano Base CARFAX One-Owner. PATSY LOU BUICK GMC/ MEGA LOT 810-732-7500. 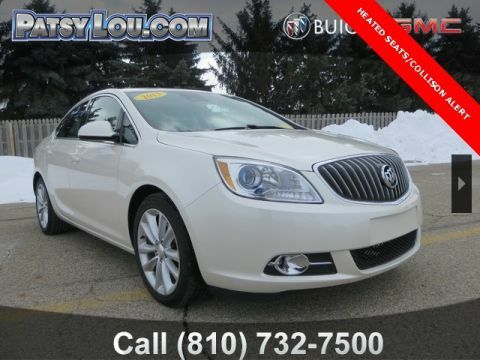 2015 Buick Verano Base Clean CARFAX. Odometer is 3115 miles below market average! PATSY LOU BUICK GMC/ MEGA LOT 810-732-7500. 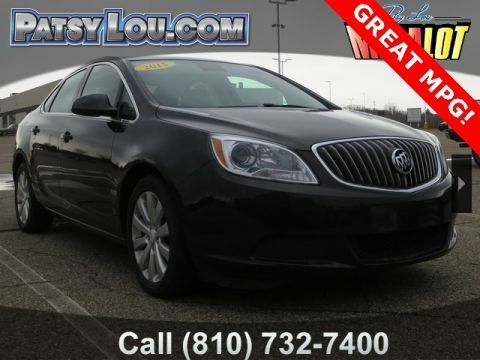 2015 Buick Verano Base Clean CARFAX. Leather, Back Up Camera, 17" x 7" Aluminum Wheels, Clean CARFAX, ECOTEC 2.4L I4 SIDI DOHC VVT, FWD, Cashmere w/Premium Leather Appointed Seat Trim, 17" x 7" Aluminum Wheels, AM/FM radio: SiriusXM, Bumpers: body-color, Driver 8-Way Manual Seat Adjuster, Dual front impact airbags, Dual front side impact airbags, Electronic Stability Control, Emergency communication system: OnStar Directions & Connections, Exterior Parking Camera Rear, Front Bucket Seats, Front dual zone A/C, Fully automatic headlights, Power door mirrors, Premium audio system: IntelliLink, Rear side impact airbag, Remote keyless entry, Variably intermittent wipers. Odometer is 1246 miles below market average! PATSY LOU BUICK GMC/ MEGA LOT 810-732-7500. 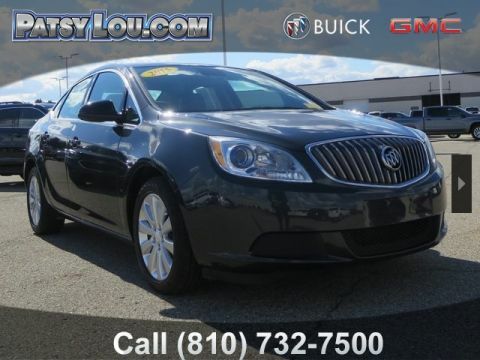 2015 Buick Verano Base Clean CARFAX. PATSY LOU BUICK GMC/ MEGA LOT 810-732-7500. Recent Arrival! 2016 Chevrolet Impala Limited LT Clean CARFAX. Odometer is 9530 miles below market average! PATSY LOU BUICK GMC/ MEGA LOT 810-732-7500. 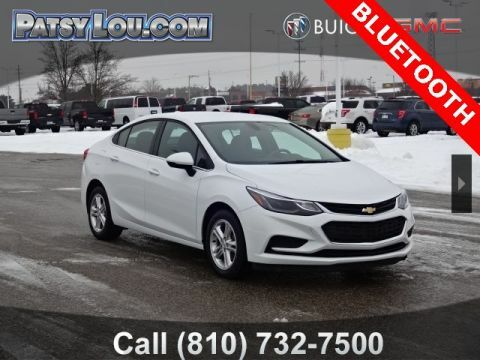 2017 Chevrolet Cruze LT Clean CARFAX. Cruze LT, 1.4L 4-Cylinder Turbo DOHC CVVT, 6 Speaker Audio System Feature, Cloth Seat Trim, Convenience Package, Driver 8-Way Power Seat Adjuster, Dual front impact airbags, Dual front side impact airbags, Emergency communication system: OnStar Guidance, Front Bucket Seats, Front Fog Lamps, Heated door mirrors, Heated Driver & Front Passenger Seat, Keyless Open, Keyless Start, Preferred Equipment Group 1SD, Radio: AM/FM Chevrolet MyLink w/7" Touch-Screen, Rear Spoiler, Remote keyless entry, Remote Vehicle Starter System, RS Lettering Ornamentation, RS Package, SiriusXM Satellite Radio, Sport Body Kit, Variably intermittent wipers. Priced below KBB Fair Purchase Price! PATSY LOU BUICK GMC/ MEGA LOT 810-732-7500. 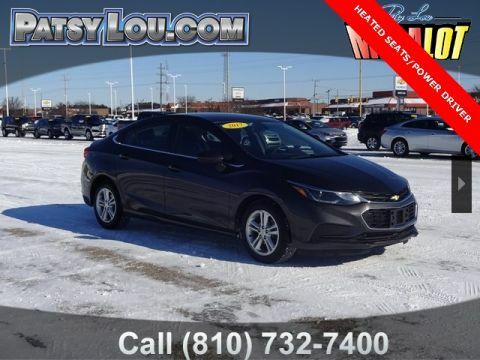 2017 Chevrolet Cruze LT Clean CARFAX. 1.4L 4-Cylinder Turbo DOHC CVVT, 6 Speaker Audio System Feature, Bumpers: body-color, Cloth Seat Trim, Convenience Package, Driver 8-Way Power Seat Adjuster, Dual front impact airbags, Dual front side impact airbags, Electronic Stability Control, Emergency communication system: OnStar Guidance, Exterior Parking Camera Rear, Heated door mirrors, Heated Driver & Front Passenger Seat, Keyless Open, Keyless Start, Preferred Equipment Group 1SD, Radio: AM/FM Chevrolet MyLink w/7" Touch-Screen, Remote keyless entry, SiriusXM Satellite Radio, Split folding rear seat, Variably intermittent wipers. Priced below KBB Fair Purchase Price! PATSY LOU BUICK GMC/ MEGA LOT 810-732-7500. 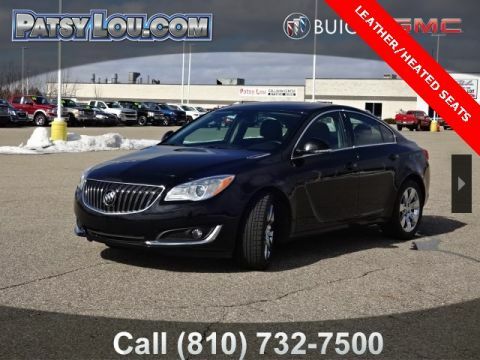 2015 Buick Verano Base Clean CARFAX. **ACCIDENT FREE CARFAX, Leather, Back Up Camera, ECOTEC 2.4L I4 SIDI DOHC VVT, 6-Speed Automatic Electronic with Overdrive, 17" x 7" Aluminum Wheels, 6 Speaker Audio System Feature, Audio System Feature, Bumpers: body-color, Driver 8-Way Manual Seat Adjuster, Dual front impact airbags, Dual front side impact airbags, Electronic Stability Control, Emergency communication system: OnStar Directions & Connections, Exterior Parking Camera Rear, Front Bucket Seats, Front dual zone A/C, Fully automatic headlights, Power door mirrors, Premium audio system: IntelliLink, Premium Ribbon Fabric Seat Trim, Radio: AM/FM/SiriusXM Stereo w/MP3 CD Player, Remote keyless entry, SiriusXM Satellite Radio, Variably intermittent wipers. Odometer is 2313 miles below market average! PATSY LOU BUICK GMC/ MEGA LOT 810-732-7500. 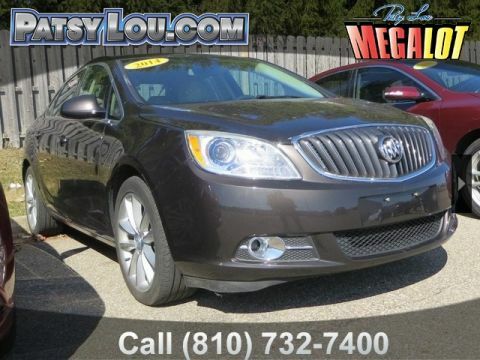 2015 Buick Verano Base Clean CARFAX. **ACCIDENT FREE CARFAX, Back Up Camera, ECOTEC 2.4L I4 SIDI DOHC VVT, 6-Speed Automatic Electronic with Overdrive, 17" x 7" Aluminum Wheels, 6 Speaker Audio System Feature, Audio System Feature, Bumpers: body-color, Driver 8-Way Manual Seat Adjuster, Dual front impact airbags, Dual front side impact airbags, Electronic Stability Control, Emergency communication system: OnStar Directions & Connections, Exterior Parking Camera Rear, Front Bucket Seats, Front dual zone A/C, Fully automatic headlights, Power door mirrors, Premium audio system: IntelliLink, Premium Ribbon Fabric Seat Trim, Radio: AM/FM/SiriusXM Stereo w/MP3 CD Player, SiriusXM Satellite Radio, Variably intermittent wipers. Odometer is 7544 miles below market average! PATSY LOU BUICK GMC/ MEGA LOT 810-732-7500. 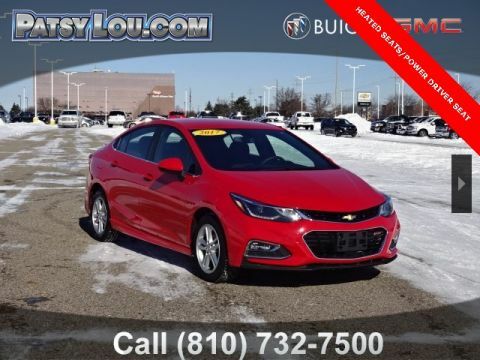 2017 Chevrolet Cruze LT CARFAX One-Owner. Clean CARFAX. 1.4L 4-Cylinder Turbo DOHC CVVT, 6 Speaker Audio System Feature, Bumpers: body-color, Cloth Seat Trim, Driver 6-Way Manual Seat Adjuster, Dual front impact airbags, Dual front side impact airbags, Emergency communication system: OnStar Guidance, Exterior Parking Camera Rear, Front Bucket Seats, Fully automatic headlights, Heated door mirrors, Passenger door bin, Preferred Equipment Group 1SD, Radio: AM/FM Chevrolet MyLink w/7" Touch-Screen, Rear window defroster, Remote keyless entry, SiriusXM Satellite Radio, Telescoping steering wheel, Traction control, Variably intermittent wipers. PATSY LOU BUICK GMC/ MEGA LOT 810-732-7500. 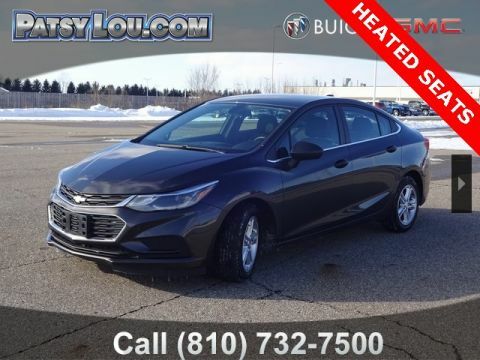 2017 Chevrolet Cruze LT Cruze LT, 1.4L 4-Cylinder Turbo DOHC CVVT, 6 Speaker Audio System Feature, Alloy wheels, Bumpers: body-color, Cloth Seat Trim, Driver 6-Way Manual Seat Adjuster, Dual front impact airbags, Dual front side impact airbags, Emergency communication system: OnStar Guidance, Exterior Parking Camera Rear, Heated door mirrors, Power steering, Radio: AM/FM Chevrolet MyLink w/7" Touch-Screen, Remote keyless entry, SiriusXM Satellite Radio, Telescoping steering wheel, Variably intermittent wipers. Priced below KBB Fair Purchase Price! PATSY LOU BUICK GMC/ MEGA LOT 810-732-7500. 2014 Chevrolet Malibu LT 1LT Clean CARFAX. Alloy wheels, Chevrolet MyLink, MP3 decoder, Remote keyless entry. Odometer is 46779 miles below market average! PATSY LOU BUICK GMC/ MEGA LOT 810-732-7500. 2015 Buick Verano Convenience Group Clean CARFAX. **ACCIDENT FREE CARFAX, LEATHER, SUNROOF, LOW MILES, ECOTEC 2.4L I4 SIDI DOHC VVT, 6-Speed Automatic Electronic with Overdrive, Cashmere w/Premium Leather Appointed Seat Trim, 6 Speaker Audio System Feature, Audio System Feature, Auto-Dimming Inside Rear-View Mirror, Auto-dimming Rear-View mirror, Blind spot sensor: warning, Bumpers: body-color, Driver & Front Passenger Heated Seats, Driver 6-Way Power Seat Adjuster, Dual front impact airbags, Dual front side impact airbags, Electronic Stability Control, Emergency communication system: OnStar Directions & Connections, Exterior Parking Camera Rear, Front dual zone A/C, Front Passenger 8-Way Manual Seat Adjuster, Fully automatic headlights, Garage door transmitter, Heated Front Bucket Seats, Outside Heated Power-Adjustable Mirrors, Power driver seat, Power Tilt-Sliding Sunroof w/Sunshade, Radio: AM/FM/SiriusXM Stereo w/MP3 CD Player, Remote keyless entry, Side Blind Zone Alert, SiriusXM Satellite Radio, Telescoping steering wheel, Ultrasonic Rear Parking Assist w/Audible Warning, Universal Home Remote, Variably intermittent wipers, Wheels: 18" x 8" Multi-Spoke Machine-Faced Alloy. Odometer is 713 miles below market average! PATSY LOU BUICK GMC/ MEGA LOT 810-732-7500. Recent Arrival! 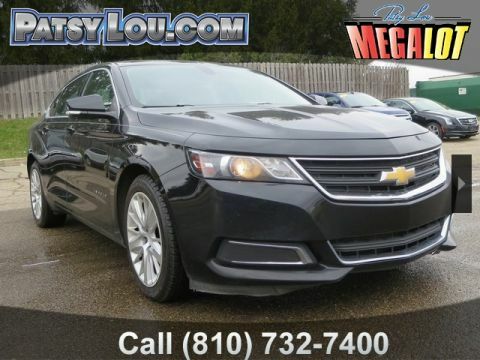 2015 Chevrolet Impala LS 1FL Clean CARFAX. Odometer is 27464 miles below market average! PATSY LOU BUICK GMC/ MEGA LOT 810-732-7500. 2015 Buick Regal Turbo/e-Assist Premium I Clean CARFAX. **ACCIDENT FREE CARFAX, **ONSTAR**, Regal Turbo/e-Assist Premium I, 2.0L 4-Cylinder DGI DOHC VVT Turbocharged, 7-Speaker Audio System Feature, 8-Way Power Front Passenger Seat Adjuster, Alloy wheels, Auto-dimming Rear-View mirror, Dual front impact airbags, Dual front side impact airbags, Electronic Stability Control, Emergency communication system: OnStar Directions & Connections, Exterior Parking Camera Rear, Front Bucket Seats, Front dual zone A/C, Garage door transmitter, Heated door mirrors, Heated Driver & Front Passenger Seats, Heated steering wheel, Leather-Appointed Seat Trim, Radio: Buick IntelliLink AM/FM Stereo w/CD Player, Rear Parking Sensors, Remote keyless entry, Single-Slot CD/MP3 Audio System Feature, SiriusXM Satellite Radio, Variably intermittent wipers. Priced below KBB Fair Purchase Price! PATSY LOU BUICK GMC/ MEGA LOT 810-732-7500. 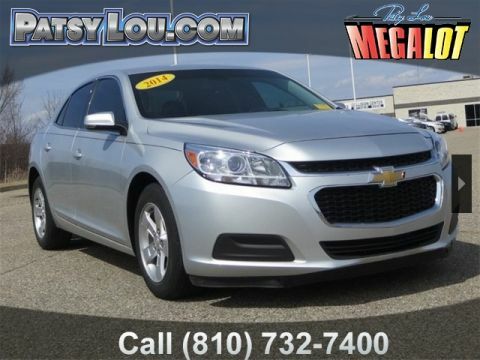 2018 Chevrolet Malibu LT 1LT CARFAX One-Owner. Clean CARFAX. CARFAX ONE OWNER, **ONSTAR**, Malibu LT 1LT, 1.5L DOHC, 120-Volt Power Outlet, 6-Speaker Audio System Feature, 8-Way Power Driver Seat Adjuster, Alloy wheels, Convenience & Technology Package, Driver Information System w/Color Display, Dual front impact airbags, Dual front side impact airbags, Dual USB Charging-Only Ports, Electronic Stability Control, Emergency communication system: OnStar and Chevrolet connected services capable, Exterior Parking Camera Rear, Heated door mirrors, Inside Rear-View Auto-Dimming Mirror, Leather-Wrapped Shift Knob, Preferred Equipment Group 1LT, Premium Cloth Seat Trim, Radio: Chevrolet MyLink AM/FM Stereo w/8" Screen, Remote Vehicle Starter System, SiriusXM Satellite Radio, Turn signal indicator mirrors, Variably intermittent wipers, Wireless Charging For Devices. Priced below KBB Fair Purchase Price! PATSY LOU BUICK GMC/ MEGA LOT 810-732-7500. When you choose Patsy Lou Buick GMC for your low-mileage used car purchase, you not only get the benefit of a good car at a great price, you’ll also get access to our convenient online tools and dedicated staff that make car buying a hassle-free endeavor. Explore our inventory from the comfort of your home, find specials on high-quality pre-owned options, see how much your trade-in vehicle is worth, get pre-approved for financing, and check manufacturer incentives on one of the new cars in our inventory at a time when it’s convenient for you. On top of all that, you’ll get the Patsy Lou Advantage—complete with a $2,000 minimum trade-in value and a world-renowned sales and service staff. When you’re ready, contact us to set up a test drive!